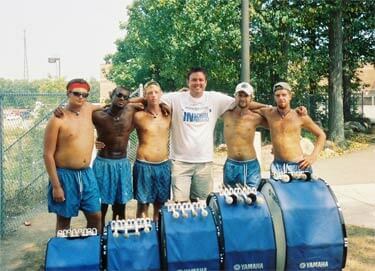 I was a member of the 2005 Bluecoats bass line. This picture was taken at our 2005 finals week housing site in North Attleboro, Mass. This was taken right after we finished our warm-up before ensemble block. For us, this season started and ended the best way possible, as a section that knew how to work hard and be the best we could be, while also being able to just chill and get along with each other. From left to right: Jim, myself, Jon, Adam Clay (our tech), Zach and Mike. I was lucky enough to be able to finish six years of drum corps off with the best group of guys I could ask for. I thank them for all the hard work this past season and I wouldn't have had it any other way. Thanks Arnold!